This isn’t a stellar class of First Baseman and that can partially be attributed to the fact that often some of Major League Baseball’s best first baseman play third base for much of their Minor League career. See Teixeira, Mark. This year’s crop of prospects is no exception as Pittsburg’s Pedro Alvarez and Toronto’s Brett Wallace will likely spend the majority of their MLB career at first base. For now however, I’ll be ranking those two among the third baseman until their clubs move them off of the position. It’s also important to note that Seattle’s Dustin Ackley will be ranked among the outfielders. BATS – THROWS – HEIGHT – WEIGHT – TEAM – D.O.B. 1. Justin Smoak – B-L – 6’4 220 – TEX – 12.5.86. Imagine that you are a future 1st round pick as well as the top prospect at your position and yet you weren’t even the best player on your high school team. That was Justin Smoak and that’s what he gets for going to school with a kid named Matt Weiters. Smoak didn’t sign when the A’s selected him in the 16th round of the 2005 draft, instead choosing to go to South Carolina. Three years later the Rangers would use the 11th overall selection on Smoak and he signed for $3.5MM. Smoak only hit 12 HR during the regular season last year then went on to hit 9 in just 14 games during the World Cup. A switch hitter with power, Smoak is a better hitter at this point against right handed pitching as he hit just .196 from the right side in 50 AA games compared to .379 from the left. The splits evened out a bit when he went to AAA going .231 from the right and .250 from the left. Smoak has nice loft to his swing and possesses great patience at the plate (15.9% BB Rate) and a great .925 BB/K ratio. He will likely begin the season back in AAA Oklahoma City where he finished 2009 but he should arrive in Texas after the All Star Break. 2. Logan Morrison – L-L – 6’2 215 – FLA – 8.25.87. It’s strange that a player coming off of a league MVP season (High A Florida State League) and misses significant time the following season with a broke thumb still improves his stock, but Morrison did just that. He saw his walk rate jump from 10.3% to 18.4% and his BB/K ratio went from a solid .71 to an amazing 1.37. Morrison is athletic enough to play LF and was used out there sparingly in 2009 but his home is 1B. To reach his ceiling as an All Star 1B, he’ll need to improve v. LHP as he hit just .233 against them last year. 3. Chris Carter – R-R – 6’4 210 – OAK – 12.18.86. Drafted by the White Sox out of a Las Vegas HS in 2005, Carter has already been traded twice. First to the Diamondbacks for Carlos Quentin then again to the Athletics with Brett Anderson and Carlos Gonzalez for Dan Haren. Carter rivals Florida OF Michael Stanton as having the most power of any current prospect in the Minor Leagues. He won the AA Texas League MVP posting a 1.011 OPS with 67 XBH. Strikeouts will always be a concern for Carter but he did cut down on his hideous 30.8 K% of 2008 to a less atrocious 24.3% in 2009. Carter’s swing reminds me a little of Glenallen Hill’s as he appears to commit too early, guess at a spot and swing hard. My apologies for the grainy Glenallen Hill clip, but there is not an abundance of footage of his swing on the interweb. 4. Yonder Alonso – L-R – 6’2 215 – CIN – 4.8.87. Originally drafted as a catcher by the Twins in the 16th round in 2005, Yonder decided instead to go to college where he, Jemile Weeks, Carlos Gutierrez, Dennis Raben, and Blake Tekotte led Miami to the College World Series in 2008. Yonder hit just .231 v. lefties in High A Sarasota, and just .242 v. them in AA Carolina while hitting over .315 v. righties at both levels. He broke his hamate bone in his right hand last year and that may hinder his 2010 power numbers. If I were Cincinnati, I’d start him where he finished 2009, in AA. Before the start of the 2011 season, Cincinnati will have to decide to either move Joey Votto to LF or trade either him or Alonzo. 5. Freddie Freeman – L-R – 6’5 220 – ATL – 9.12.89. A second round pick in the same 2007 draft the Braves selected Jason Heyward #14 overall, Freeman broke out in 2008 when he put up a .316/.378/.521 line in the South Atlantic League where he had 18 HR and 33 2B. He didn’t fair as well in 2009, totaling just 8 HR between High A and AA. His season was cut short by a left wrist injury that didn’t require surgery. If I’m Atlanta, I’d start Freeman back in AA Mississippi with the hopes that he can compete for the 1B job in Atlanta in 2011. 6. Lars Anderson – L-L – 6’4 215 – BOS – 9.25.87. Had this blog been operating a year ago at this time, Anderson might have ranked as my top 1B. He was coming off of a year where he dominated High A and AA showing the ability to hit for average, power and maintained his high OBP capabilities. 2009 was a disaster as his AVE dropped from .317 to .233 and his HR production dropped from 18 to 9. The only knock on Lars heading into this past season was that he could be too patient at the plate. This may have been the primary contributing factor to his awful 2009. His BB rate was still high at 12.3% and he pretty much maintained his K rate. Perhaps he just wasn’t aggressive enough with hittable pitches early in the count and was forced to hit pitchers pitches. If he can adjust his approach he could return to form, but it’s clear he’s not as close to being ready to contribute in Boston as we previously thought. 7. Eric Hosmer – L-L – 6’4 215 KC – 10.24.89. Hosmer was regarded as the most advanced HS bat in the 2008 draft and was selected by the Royals with the 3rd overall pick. He fell victim to the same slow start that his Royals orgmate Mike Moustakas suffered in the cold Midwest League. Hosmer’s struggles were more troubling to me however, as he seemed to have developed mysterious vision problems. Also, at the time of the draft Hosmer was thought to have been athletic enough to handle a move to a corner outfield position if necessary but he has proved to be a slower runner than previously thought. Hosmer will have to prove he can hit left handed pitching in 2010 to regain his elite prospect status. A glimmer of hope from last season was his above average 13.5 BB% in 280 Low A AB’s. 8. Ike Davis – L-L – 6’5 195 – NYM – 3.22.87. A teammate of fellow 2008 first rounder Brett Wallace at Arizona State, Davis went his entire professional debut season without a HR, hitting only 15 2B, and posting a pedestrian SLG of just .326. Something clicked with Davis in 2009 however as he smashed 20 HR, slugged .524 and posted a .905 OPS. Even with just a half season of AA under his belt, Davis might be the best first base option in the entire Mets organization. While Daniel Murphy and Fernando Tatis may start the season as the options at that position, Davis should finish it. 9. Brandon Allen – L-R – 6’2 235 – ARI – 2.12.86. The 2nd player on this list to come from the White Sox organization, Allen was traded to Arizona in 2009 in exchange for RHP Tony Pena. Upon his arrival in the Arizona system, Allen killed Pacific Coast League pitching, posting a .317 ISO and hitting 12 HR in just 145 ABs. He earned a promotion to the big club in Arizona and smacked another 4 HR in 104 ABs there. Allen has solid plate discipline and will post BB rates around the league average while he’ll K at more than the league average. If he can win a job out of spring training, he’d be a sleeper in the NL Rookie of the Year race. 10. Brandon Snyder – R-R – 6’2 210 – BAL – 11.23.86. Drafted as a catcher with the 13th overall pick in the 2005 draft, Snyder later moved to 1B while sprinkling in a few games at 3B each year since. I’ve only seen him play twice, but he showed pretty good lateral movement at 1B in those games. Snyder made some positive strides in 2009. After walking just 29 times in 116 games in 2008, he walked 51 times in 131 games this past season. I don’t see Snyder ever being a power hitting 1B but he’s a good enough hitter to have an MLB career serving as an occasional regular depending on who else is on the roster at the time. 11. Ryan Wheeler – L-R – 6’4 220 – ARI – 7.10.88. A 5th round selection out of Loyola Marymount in 2009, Wheeler posted an outstanding .461 OBP and .538 SLG in the short season Northwest League. He hit 20 2B in just 64 games there and walked 37 times to just 28 Ks (1.32 BB/K Ratio). He continued to mash in a small 8 game sample in the Low A Midwest League. His combination of hit tools paired with the offense slanted High A California League could result in gaudy numbers and subsequently vault Wheeler into elite prospect status. 12. David Cooper – L-L – 6’0 200 – TOR – 4.12.87. Cooper was the 3rd of 5 college first basemen selected in the 1st round of the 2008 draft (Yonder Alonso, Justin Smoak, Ike Davis and Allen Dykstra). He had a solid but unspectacular 1st full professional season. Spending the whole year in AA New Hampshire, he hit 32 2B but but managed just a .389 SLG. His decent 11.0% BB rate couldn’t completely off set his low AVE (.258) so he managed an OBP of .340. First basemen with an OPS of .729 are a dime a dozen and I don’t see him helping Toronto in 2010. 13. Anthony Rizzo – L-L – 6’3 220 – BOS – 8.8.89. Rizzo was a 2007 draftee yet he just played his first full season in 2009. His 2008 season was cut short after being diagnosed with Hodgkins’s Lymphoma, which is now in remission. With 50 BB’s and 99 K’s last year he doesn’t blow you away with is plate discipline. Not yet a HR hitter, when someone hits 37 2B as a 20 year old, the HRs are likely to follow. One more strong and healthy year for Rizzo and he should move ahead of Lars Anderson as the 1B of the future for Boston. 14. Gaby Sanchez – R-R – 6’1 235 – FLA – 9.2.83. Drafted as a catcher from the University of Miami in 2005, Sanchez is another Marlins 1B prospect with OBP skills. Sanchez walked nearly as much as he struck out (0.95 BB/K ratio) in 2009 and had an equally impressive 0.99 ratio in 2008. Sanchez played 41 games at 3B for AAA New Orleans last year but he made 12 errors in that short span. No matter how Florida will try to get both he and Morrison on the field at the same time, they are both first basemen by nature and the only way they’ll be in the field together is if they are playing against each other after one of them is traded. With Morrison a level behind him, I think Sanchez wins a big league job in spring training and has a successful rookie year. 15. Jeff Malm – L-L – 6’3 225 – TB – 10.31.90. The Rays selected Malm in the 5th round and signed him away from a strong USC commitment for $680,000 in 2009. Malm was a starter on 4 state championship teams for Bishop Gorman High in Las Vegas and tied a High School career record for hits with 277. Malm hit 15 HR during his senior season and as a former pitcher, he’ll have a strong arm for a 1B. 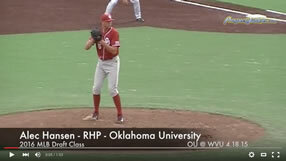 Ranking Malm 15th at his position is certainly ambitious on my part, but with his HS resume, he should be as prepared for professional baseball as any prep hitter could be. Sleeper – Dennis Raben – L-L – 6’3 220 – 7.31.87. Raben was an integral part of the aforementioned stacked Hurricane team of 2008. He had a strong professional debut that same year, posting a .971 OPS, a 17.0% BB rate and a .79 BB/K ratio, although his 26.4% K rate is a concern. He missed all of 2009 with knee surgery. Raben was never a good defensive outfielder so the move to 1st will only help his prospect status. He’ll likely start in Low A, but if he starts hot, gets promoted and can spend significant time in the High A California League, I expect him to but up great numbers. There are a lot of ifs in that sentence, but I suppose that’s why he’s a sleeper. Overrated – Ryan Strieby – R-R – 6’5 235 – 8.9.85. There is a lot to like about Strieby. The .991 OPS, the 15.7 BB Rate, and the .262 ISO are all impressive but I feel the 27.2 K% is a pretty big red flag. He also had an unusually high batting average on balls in play (“BABIP”) of .359 last season. An average BABIP is right around .290. BABIP encompasses several uncontrollable variables such as strength of the defense, and well….luck. An unusually high BABIP one year could mean a fall back to earth the next. I think Strieby will struggle in AAA Toledo in 2010. Nice analysis. How much power do you think David Cooper and Anthony Rizzo will develop? Do you like Chris Marrero at all? Thanks Luke. I originally listed Marrero at 14 but he was later bumped. I don't dislike him but I start these rankings with 30 names and try to narrow it down. Marrero was the last cut so I guess that puts him at 16. He would have been fairly high on this list two years ago so I might be guilty of a little prospect fatigue with him. Carlos Carrasco syndrome maybe. Regarding Rizzo, it's tough project his future power potential because of the cancer recovery. He's never posted an ISO above .200 but as he gets stronger more power could develop. As for Cooper, I'm a little skeptical because of his small stature. Sure it could happen, but there is a lot more projection in Rizzo's 6'3 – 220 body than Coooper's 6'0 – 200 frame. I would move Logan Morrison down to #7 and move Ike Davis up to #4. I really think Davis is much better than people believe. I think he will join Freeman as starting 1stbaseman in the NL east in 2011. Thanks for the comment Brian. You could definitely make the case for Davis over Hosmer and Anderson as he certainly out performed them in 2009. I'd be curious to find out why you are down on Morrison.